What was the best news of the year? That’s a difficult question to answer if you believe in small government and you work in Washington. We certainly didn’t get the things on my Christmas list, like genuine entitlement reform and fundamental tax reform. Santa also forget to give me much-needed spending caps, like they have in Switzerland and Hong Kong. But there is reason for hope. 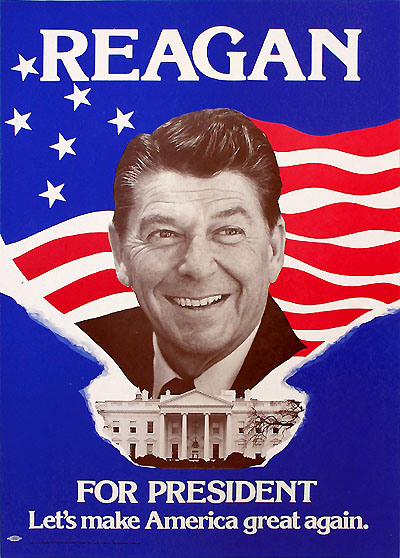 The political elite may be a bunch of self-serving statists, but ordinary citizens still have a core belief in liberty. 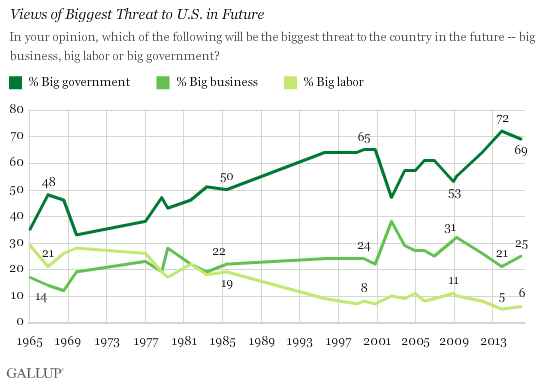 The folks at Gallup, for instance, asked Americans about the biggest threat to America’s future. As you can see, they wisely and astutely named big government. By an overwhelming margin. In another poll, CNN reports that Americans generally are not happy with Washington. Heading into the final year of Barack Obama’s presidency, the American public…expresses broad dissatisfaction with government and anger about the way things are going in the nation generally. According to a new CNN/ORC Poll, 75% of Americans say they are dissatisfied with the way the nation is being governed, and 69% are at least somewhat angry with the way things are going in the U.S., both metrics about as negative as they were in fall 2014. Though I suppose I shouldn’t be too encouraged by this data. After all, what if they’re dissatisfied because government isn’t giving them enough goodies? But I’m reasonably hopeful that the unhappiness is for the right reasons. For example, here’s some encouraging polling data from Pew that was shared by James Pethokoukis of the American Enterprise Institute. 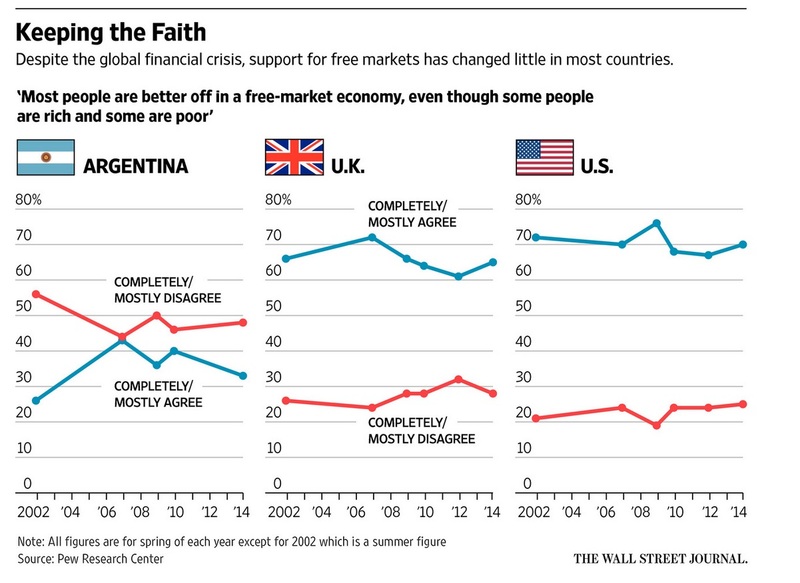 Strong support for free enterprise as a generic principle doesn’t automatically translate into support for free markets on every issue, of course, but I’m glad people in the United States at least have good instincts (unlike the misguided citizens of Argentina). By the way, I can’t help grousing about the way the folks at Pew presented this data. Notice how the subheading starts with “despite the global financial crisis,” which implies that it was the fault of free markets. At the risk of repeating myself for the umpteenth time, it was bad monetary policy and corrupt subsidies from Fannie Mae and Freddie Mac that deserve the lion’s share of the blame for that mess. Anyhow, back to polling data. While I’m encouraged by some of the polling data above, I’m not under any illusion that people always have the right instincts. Or that they even have consistent views. Here’s some polling data that was put together for the Legatum Institute. The bad news is that a lot of people believe in the false left-wing narrative that the economy is a fixed pie and the rich get richer at the expense of the poor. I addressed that issue a few days ago, but the most compelling evidence is in these videos from Learn Liberty, Marginal Revolution, and the Fund for American Studies. On the other hand, the good news is that perhaps people already have watched these videos. 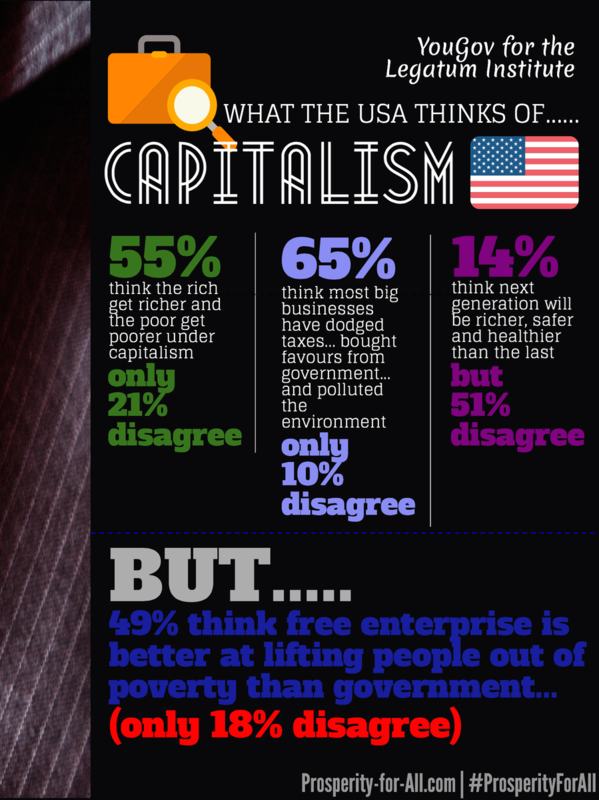 That because they also strongly believe that free enterprise is the best way of improving life for the poor. P.S. Let’s end 2015 with some Donald Trump humor. I haven’t written much about the Donald, other than to point out that he has a reasonably good tax plan (though perhaps not a serious one). But he does generate amusement value. 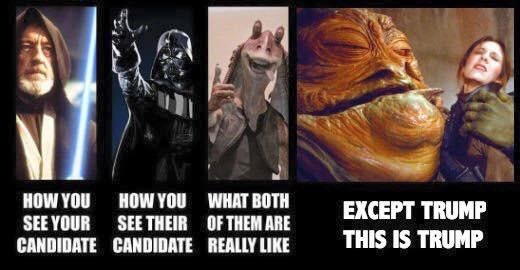 Here’s some anti-Trump humor, sort of similar to the how-the-world-sees-libertarians joke I’ve previously shared. And here’s some pro-Trump humor (depending on your perspective. He’s not my cup of tea, but you have to give Trump credit for dominating the election. Whether he’s making dumb statements or smart statements, he knows how to work the media. For what it’s worth, my preferred candidate isn’t available this election, though the fact that he wins this poll (and also this poll) is yet another sign that the American people still have very sensible instincts. P.P.S. Here are some great videos of that candidate in action. And here’s one more if you those weren’t enough.